A chinois is a fine, metal strainer, sometimes referred to as a bouillon strainer. It is great for removing pulp from purees and other liquids. You can use something like cheesecloth for many preparations but a chinois makes the process easier in many cases. If you want your sauces and soups to be silky smoother an investment in a chinois is a good one. Although they are both conically shaped, a chinois and a China cap are different. The chinois is made with a very fine mesh, often of stainless steel. A China cap is strainer of perforated metal with much larger holes than a chinois. When purchasing a chinois there are many offerings to choose from. Some come in sets with a stand and pestle, but most are sold separately. 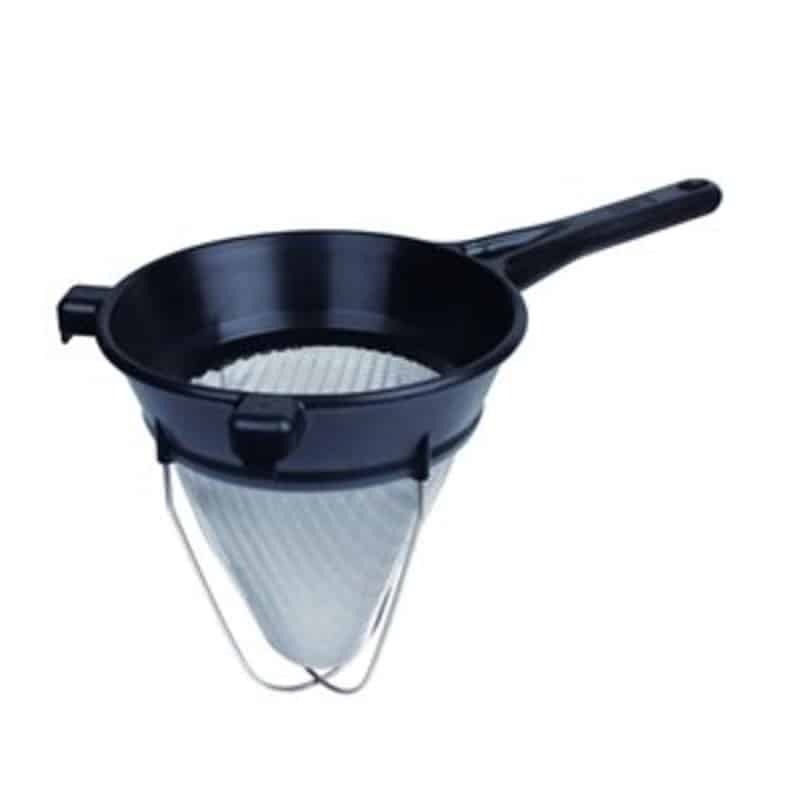 We recommend the Matfer 17360 Exoglass Bouillon Strainer . This one is very unique because of its heat-resistant plastic handle and lip. 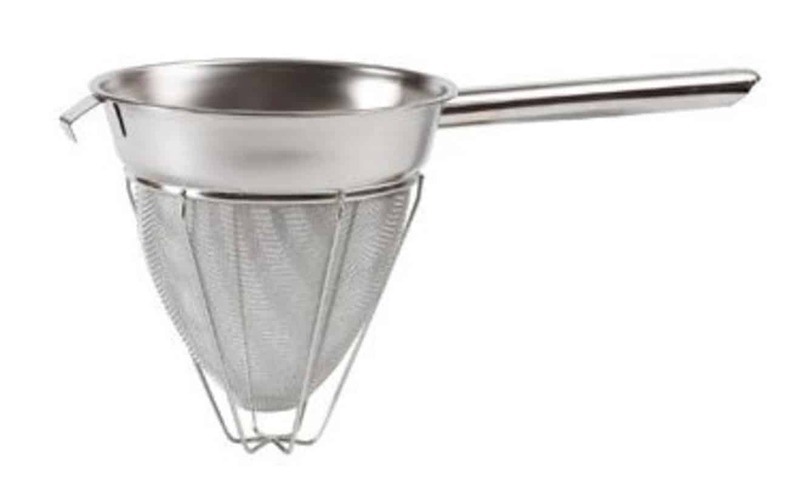 Most strainers are completely stainless steel which is also very serviceable. However, this Exoglass plastic is heat resistant up to 430 degrees Fahrenheit. Not only that but the handle is further insulated to keep it comfortable to hold even when it's in use over a hot stove. Since the plastic is molded in one piece it is very easy to clean. Moreover, the Matfer has strong wires outside the cone which help to protect the fine stainless steel mesh from getting punctured. It has two hooks in the front, rather than the more common single hook, which helps keep the chinois balanced when pouring in liquid. 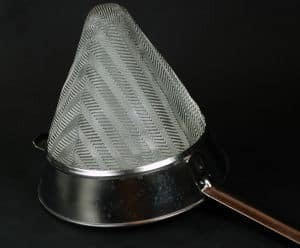 This strainer was extremely highly rated on Amazon and was the top rated chinois of those tested by Cooks Illustrated by scoring the highest mark in all four categories. Do remember you will also want to purchase a pestle to go with your chinois. Although some chefs just use the back of a wooden spoon to push contains through the mesh most prefer using a wooden pestle since it is more efficient. They normal range in price from $7.00 to $25.00. If you're strapped for cash you can opt for the Winco CCB-8R Bouillon Strainer, 8", Extra Fine Mesh, ReinForced . This chinois is about a third the cost of the Matfer unit above. It is also highly rated on Amazon and second in the Cooks Illustrated tests. It also has the wires protecting the extra fine mesh but only one hook on the front making it a little less stable when in use.